When Frenchman Arsene Wenger became the manager of the Arsenal football team in 1996, the players were not amused. Marie Antoinette might have been in favour of cake but Wenger took the opposite view: half-time Mars bars were out, broccoli was in. The proof was in the (lack of) pudding – within two years the team went from being lardy losers to league and FA Cup champions. I haven’t played football since about 1985, but broccoli is still held in high esteem in my household. 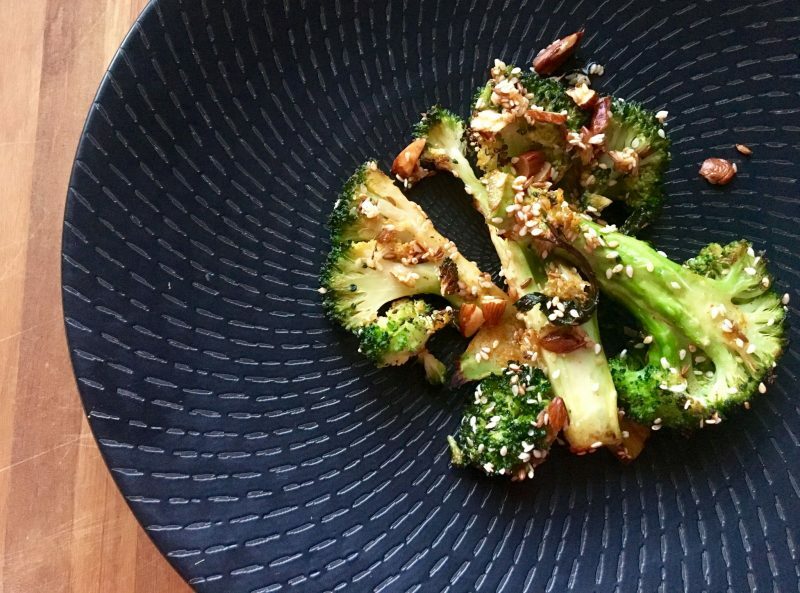 We call it healing broccoli and it’s the perfect panacea if you’ve been overdoing it in any way. I can’t promise these recipes will help boost your skills when it comes to the beautiful game, but they’re highly likely to score you points at dinner time. This should dispel any scary memories of over-boiled broccoli for good. You can skip blanching the broccoli if you like but it makes it much easier to cut it into steaks. If you can’t be bothered (and are ok with broccoli rubble going everywhere), add another 5-10 minutes to the roasting time. The dressing is optional, but addictive. Heat the oven to 210C and put a baking tray in the oven to heat up. Fill a large pot with water and bring to a boil. Drop in the broccoli and cook for two minutes, then drain well. Put the seeds, nuts, salt and spices in a large bowl. Mix well and add most of the oil. Stir through the broccoli until it’s evenly coated with the spice mixture. Arrange the broccoli on the hot tray, drizzling over the remaining oil and any spice mixture that’s left in the bowl. Roast in the oven for about 15 minutes, turning half way through. Transfer to a platter, season with freshly ground black pepper and serve with the tahini dressing on the side. To make the dressing, put the garlic paste, lemon zest and lemon juice in a small bowl. Mix well, then whisk in the tahini, olive oil, yoghurt and water (add a little extra water if it seems very thick). Taste for seasoning, then set aside. This can be made in advance and stored in a covered container in the fridge for a couple of days before using. This is a guaranteed family-friendly no-waste dinner that will both encourage your children to eat their greens and use up that rapidly staling baguette in the bread bin. Work fast and you can have this on the table in under 20 minutes. Fill a large pot with water and bring to a boil. Drop in the broccoli and cook for two minutes, then lift out with a pair of tongs and drop into a sieve. Put the lid on the pot and set it aside – you’ll reuse this water to cook the pasta. Set the broccoli on a board and chop into 1-2cm pieces (including the stalk). Return the pot of water to the heat. When it’s boiling, add a generous spoonful of salt and the pasta. Cook for 10-12 minutes (according to packet directions). While the pasta is cooking, set a heavy frying pan over medium heat and add the oil. Add the breadcrumbs, garlic, capers and sundried tomatoes. Cook for five minutes, stirring often, until the breadcrumbs are golden. Add the olives and broccoli and toss over the heat for another 2-3 minutes. Drain the pasta and add to the frying pan. Toss everything together, then divide between four bowls. Let diners help themselves to grated Parmesan at the table. I’m loving that tahini dressing on the poor, reviled broccoli. I understand from my in-house football advisor (aka my wife) that all did not go so well at Arsenal in recent times. I’m wondering if there might be long-term psychological consequences of too much broccoli.